There are four main versions of the Eucharistic Prayer that are usually used at Mass. 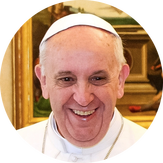 In speaking about marriage, Pope Francis departed from his prepared text to say, “When I hear the confession of a young married man or woman, and they refer to their son or daughter, I ask, 'How many children do you have?' and they tell me. Maybe they're expecting another question after that, but I always ask, 'And tell me, do you play with your children? Do you waste time with your children? '” "The free gift of a parent's time is so important," he said.